Last month, the Kansas City Planning and Development Department released the long-awaited draft of the Midtown Plaza Area Plan, which was the culmination of several years of groundbreaking community engagement in the area from 31st Street on the north to 55th Street on the south, State Line to the west, and The Paseo to the east. The plan spans several different eras of Kansas City’s urban development – from the settlement of Westport, to the early suburban expansion on Kansas City’s streetcar routes and historic boulevards, to J.C. Nichols’ shopping and housing developments, to the more recent urban renewal-inspired efforts of the 1990s. This large and complex area with a notable history of development disputes was split into four separate working areas to be more manageable throughout the planning process. One significant outcome of this plan is the introduction of the concept of development form – based loosely on some of the elements of Kevin Lynch’s The Image of the City. Within the development form framework are four basic types of places—corridors, nodes, districts, and neighborhoods. The principal focus of corridors is movement, and we find activities that respond to the type of movement offered in each corridor. Ideally, Midtown’s corridors are multi-modal, accommodating not just automobile traffic, but also transit users, bicyclists, and pedestrians. As such, development will respond to that multi-modal activity with fewer drive-thru restaurants and parking lots, and more zero-lot line buildings with active ground floor uses. Nodes are places of increased intensity in a community. They may be at the intersections of major roadways or at major transit stops, or at important or distinct moments within a neighborhood or district or along a corridor. Districts serve a single purpose, have a single identity, or a single owner and operate as a single, coherent place. Finally, neighborhoods are a special, protected kind of area with predominately residential activities or activities that are not a particular nuisance to residential activity. As development pressure from the Country Club Plaza and other burgeoning commercial districts and corridors is exerted on surrounding neighborhoods, development form becomes a new way of understanding and resolving land use conflicts. The legal and economic foundations of zoning in an economy based on property rights are based in the resolution of these conflicts. To borrow Garrett Hardin’s turn of phrase, property owners practice mutual coercion, mutually agreed upon in order to protect a community (or the aggregate private interests of an area, for those of a more liberal mindset), from ruin due to uncoordinated and unmitigated growth. The area planning process is an act of mutual agreement upon the scope and methods of this mutual coercion. Legally, the City’s power to exercise this coercion is found in the zoning and development code, which is based fundamentally on a comprehensive plan. And while in Missouri law comprehensive plans are not well-defined and sometimes not even necessary as standalone documents, building consensus behind a strong vision is the key to implementing a plan not just to justify zoning, but also to coordinate public and private investments in a community. It is often the case that a single parcel of land is rezoned to accommodate the needs of one property owner. This practice, known as spot zoning, is regularly challenged and often ruled to be illegal. Perhaps in order to not be accused of the practice of spot zoning or otherwise arbitrary amendments to the zoning map, the City requires that the land use plan be amended every time a property is rezoned. But the problem here is that a land use plan—which should be immutable, unless stakeholders undergo again a rigorous, consensus-based process to determine the future of an area in a comprehensive fashion—is changed arbitrarily to meet the needs of one property owner. The current practice within the City Planning and Development Department is to treat the land use map and zoning map as very similar types of documents, with slightly different names, categories, and parameters. Here is an alternative—I hope not too naive—to that practice: design a land use map that isn’t intensely prescriptive or specific, but that conveys the general, long-term vision of an area. Fine-tune the zoning districts to match market conditions and reasonable property owner needs in a way that still supports this land use vision. In other words, let professional planning staff own the plans that they write and make their recommendations for rezoning based on their deep knowledge and professional commitment to that plan. Trust that the City Plan Commission are reasonable people that can be trusted to resolve matters fairly on a case-by-case basis, but all in support of a clear vision for a place. And by all means, invite the public to weigh in on these cases, but remind them of the vision and goals established in the comprehensive plans, and the fairness that the comprehensive plan process provides. In pursuit of a less specific but more enduring plan, below is a sketch of such a map. It organizes land use not according to the specific activity that might occur in one place or another, but by development form concepts and the intensity of activity that might happen in any given area. I’ll admit that part of this map is pure fantasy—other planning professionals, stakeholders, or City officials may draw the lines or create categories differently than I would. 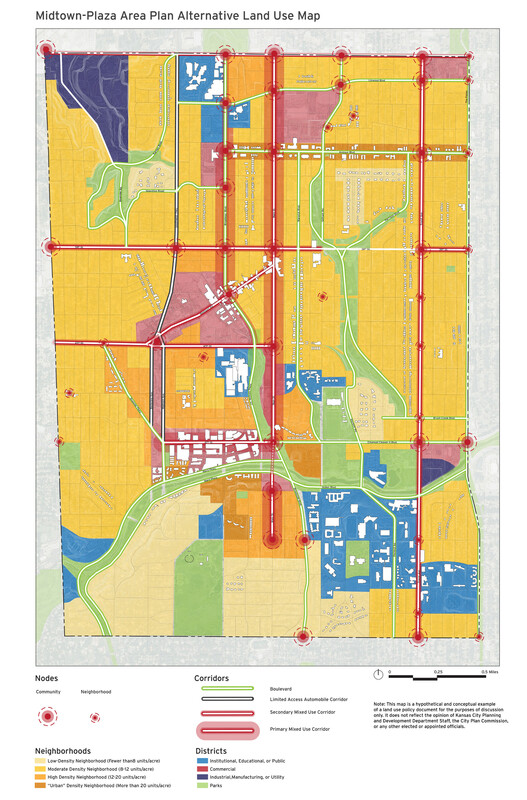 But the general organization of this land use map—the way that corridors, nodes, districts, and neighborhoods converge and overlap not as hard lines but blurred edges—reflects the flexibility necessary to facilitate change in a dynamic community. This map isn’t everything that is necessary to guide the future of the Midtown-Plaza area—the specific parameters and design guidelines of any particular area, and how conflicts and transitions are managed, require further separate guidance in the plan. But we should also remember design guidelines can’t be effectively applied universally to large areas the scale of the Midtown-Plaza community. Resolving conflict is the task of designers and design-minded development review staff. 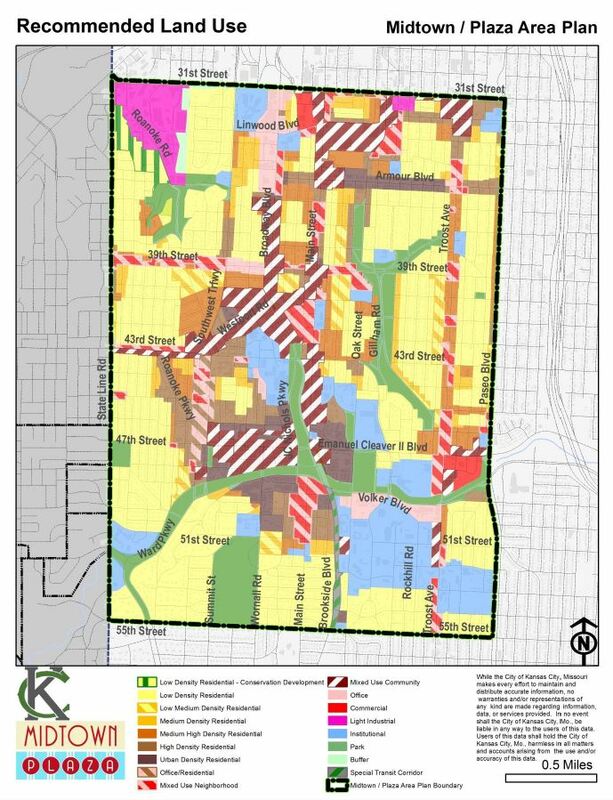 Also included in this map are building outlines in strategic areas—not as a substantive component of the land use plan or to show favoritism to any particular structure, but as a reminder to the user of the variety of scales that exist in the Midtown-Plaza area. This map also shows faint topographical contours. Though they make it messy, they’re a helpful reminder to the user that Midtown is not a flat place, and that our sense of space is informed in part by the land and environment upon which we impose our buildings. An alternative land use map for the Midtown Plaza area, combining land use and development form concepts outlined in the Midtown Plaza Area Plan. What do you think? If you drew Midtown’s 20-year land use map, what would it look like?